Yes, sign language on a cellular phone. I realize that this sounds like an incredibly joke, like a Driver’s Manual in Portuguese, but this is a study going on at the University of Washington (UW). Now, you might think that the hearing impaired could communicate via text message and Instant Messages, but I’m sure that we all know how easily a simple message with its tone could be misinterpreted. In other words, they want something where they are free to use sign language to communicate. 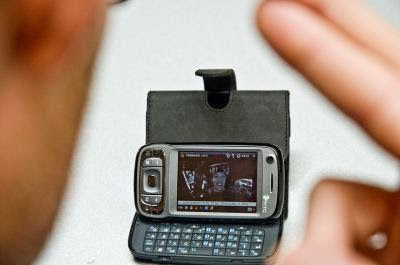 While it is true that successful phones like the EVO 4G and the iPhone 4 can do video conferencing, this feature is dependent on the user holding the phone in one of their hands. That seriously limits sign language if you are doing it one handed. There is also a problem of bandwith. Heavy bandwith conferencing could create some serious problems when the bill comes around. However, this UW team wants to use MobileASL with one tenth of the bandwith of the iPhone 4 FaceTime video conferencing. This study uses 11 students who are “academically gifted deaf or hard-of hearing pupil interested in pursuing computer careers”. It uses 200 phone calls, each one lasting an average of 90 seconds. I hope to see more about this study, as well as any improvements in mobile communication for the hearing impaired.